God’s love for us spans across many different countries, languages, and continents. If you’re looking for Spanish Christian gifts to give someone you know, our selection at Lord’s Art is exactly what you’re looking for. 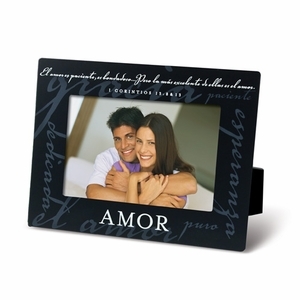 We offer many of our best-selling Christian decorations and gifts in Spanish, including photo frames, crosses, and inspirational sculpture. From our gorgeous Fe En Dios (Faith in God) Cross to our different framed prayers, you’re sure to find the perfect Spanish religious gifts to share your love in God. One of the most beautiful languages in the world, many prayers, hymns, and verses were written in Spanish and then translated to English. Just like God’s love knows no bounds for us, it knows no barriers when it comes to language as well. That’s why we carry a variety of different Spanish religious gifts in our store so that you can share your love for the Lord in whatever language you speak. Many of our best-selling gifts, such as our Christian decorations and Framed Christian art, are also sold in Spanish as well. Whatever you’re looking for in our Spanish religious gifts, you’ll be able to share the word of the Lord with someone special.